Bach or holiday home, 3 Bedrooms, 1 Bathroom and close to the beach! 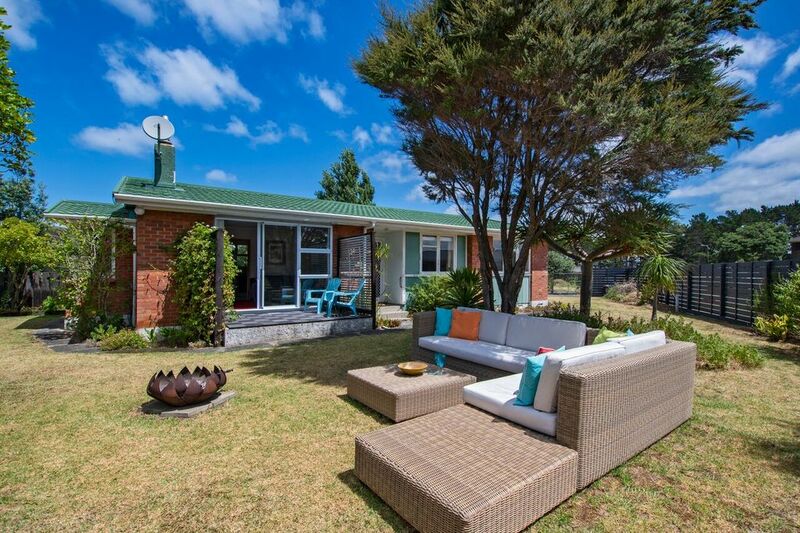 Urangatahi is a 3 bedroom Ruakaka bach with a great summer set up, just 400m to the beach. This laid back bach is an easy family option, with all the basics for a classic kiwi getaway! This Ruakaka bach includes a cosy lounge area, including a fireplace and fitted electric blankets for winter stays... For summer stays, wander out to the fully fenced garden, with ample room for your group to relax in the sun and park the boat. Wifi is unlimited! Sky and Netflix access is available on the Samsung Smart TV. The Nespresso machine is available for your morning coffee hit. There are also 2 single mattresses when required. This is a relaxed and beachy set up just an hour and half north of Auckland... Enjoy BBQ's in the backyard, or hit the beach a short stroll from your door. Urangatahi welcomes you to Ruakaka! Extras: Linen (Required, NZ$80.00 per stay); NOTE: Under Kiwi bach tradition you are expected to clean the house and do the dishes before you leave; leaving the bach the way it was on arrival! Bring your family pet - don't leave him at home! Panel heaters in each room and Kent style fire in the lounge. Kent style fire place with unlimited fire wood! Basic - salt n pepper, oil, flour, sugar tea/coffee, condiments in the fridge etc. Fully equipped kitchen with everything you need - just like at home! Great to relax outside or wander down to the beautiful white sandy beach nearby. The house was very comfortable and amazingly well equipped with everything we could possibly need. A real bonus to have a reliably fenced property for our dog too. Would loved to have stayed longer! Lovely guests, fantastic communication, well behaved dog - left our place very clean and tidy. Most welcome to stay again. A great place to stay with family both two legged and four! It was a great space that was nice, clean and comfortable. Lovely cosy place for a family holiday. Our extended family stayed at Urangatahi for 2 nights and found the house to be a perfect place for this little family holiday. Beds are comfortable with fresh linen, house is tastefully furnished and is clean. The beach is a short walk away; it felt as if we had beach all to ourselves - there weren't many people on the beach. Nice white sand, clear water and stunning views - what else to wish for?! Spacious property and home. Everything you could need. Easy walk to the beach. Lovely family with two very well behaved dogs. Left our place perfectly clean and tidy, great communication. Highly recommend to others and most welcome to stay again. Well kept and tidy bach, great entertainment set up in the living room and plenty of space for our family.